Mardi Gras in New Orleans usually means lots of Southern food—and you can’t have Southern food without grits. 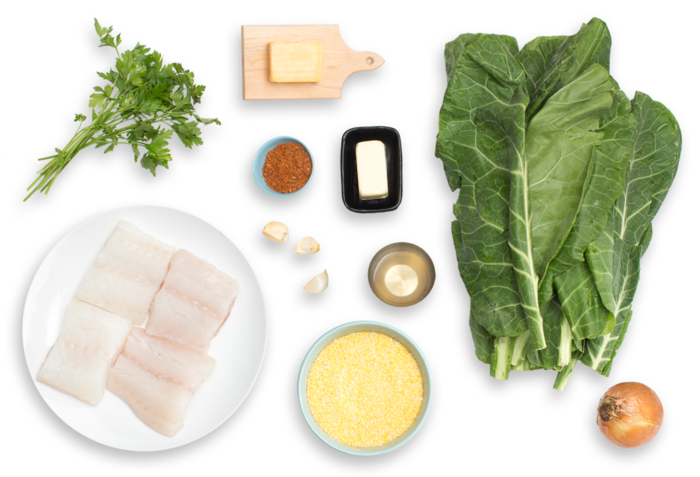 Originally a Native American dish, grits is a porridge made from ground corn that often accompanies fresh fish. 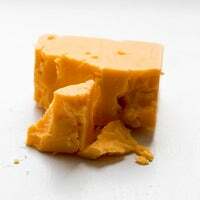 We’re adding extra flavor to ours by melting in cheddar cheese, resulting in a perfectly creamy side. And in traditional Cajun fashion, we’re blackening the drum fillets (deliciously charring their coating of spices). Wash and dry the fresh produce. Peel and thinly slice the garlic and onion. 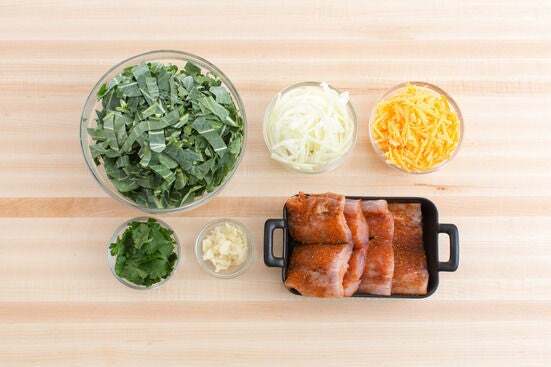 Remove and discard the stems of the collard greens; thinly slice the leaves. Pick the parsley leaves off the stems; discard the stems. Grate the cheddar cheese. Pat the fish fillets dry with paper towels; coat with half the spice blend and season with salt and pepper. In a medium pot, heat 5 cups of water and a big pinch of salt to boiling on high. Once boiling, stir in the grits; reduce the heat to low. Cook, stirring frequently, 5 to 7 minutes, or until the water is absorbed and the grits are tender. 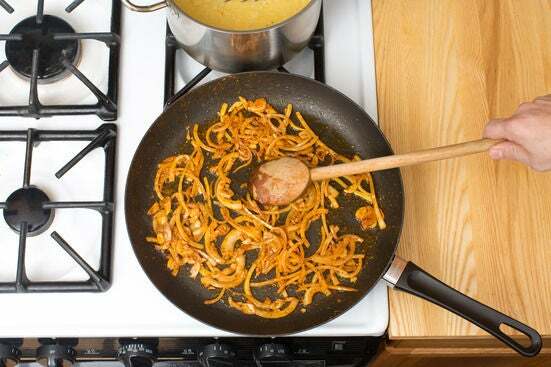 Remove from heat and stir in the butter and cheddar cheese until well combined; season with salt and pepper to taste. Cover and set aside in a warm place. Just before serving, transfer to a serving dish. 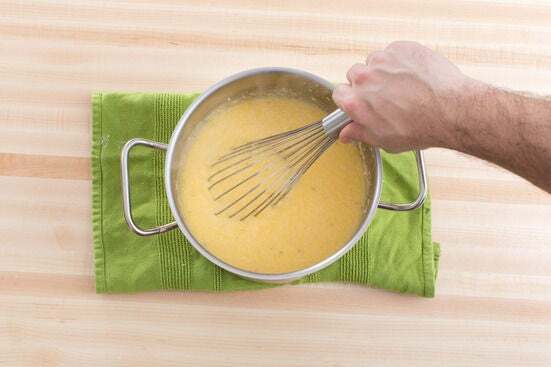 While the grits cook, in a large pan (nonstick, if you have one), heat 1 tablespoon of olive oil on medium-high until hot. Add the garlic, onion and as much of the remaining spice blend as you’d like, depending on how spicy you’d like the dish to be; season with salt and pepper. Cook, stirring occasionally, 2 to 3 minutes, or until softened and fragrant. Add the collard greens, vinegar and ¼ cup of water to the pan of aromatics; season with salt and pepper. Cook, stirring occasionally, 4 to 6 minutes, or until thoroughly combined and the collard greens have softened. Transfer to a serving dish; loosely cover with aluminum foil and set aside. Wipe out the pan. 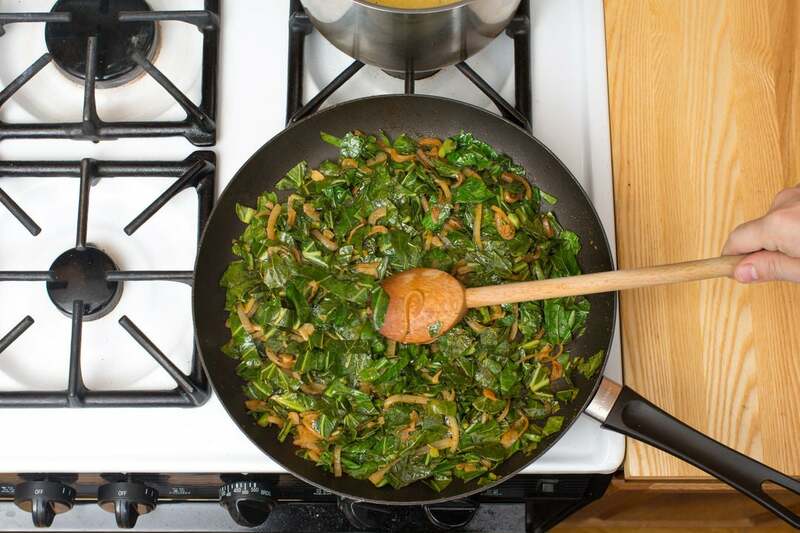 In the same pan used to cook the collard greens, heat 1 tablespoon of olive oil on medium-high until hot. 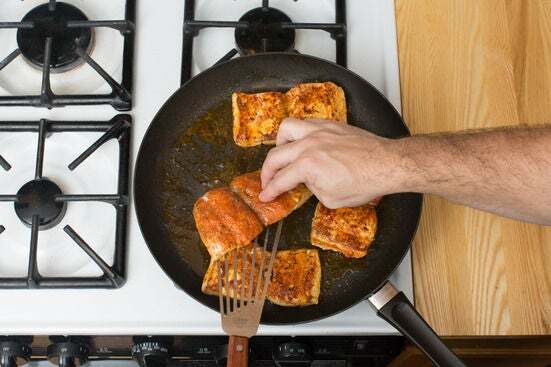 Add the seasoned fish fillets; cook 2 to 3 minutes per side, or until slightly blackened on the outside and cooked through. Remove from heat. 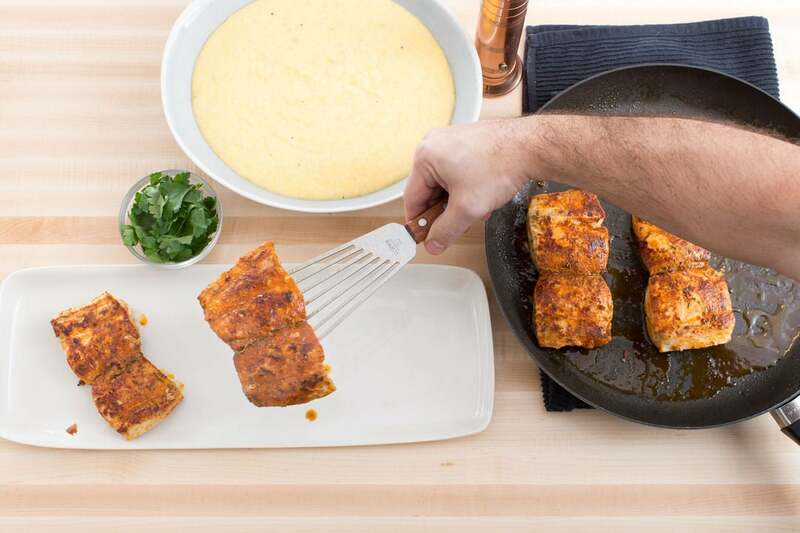 Transfer the cooked fish fillets to a serving dish; garnish with the parsley. Season the cheddar grits with pepper. 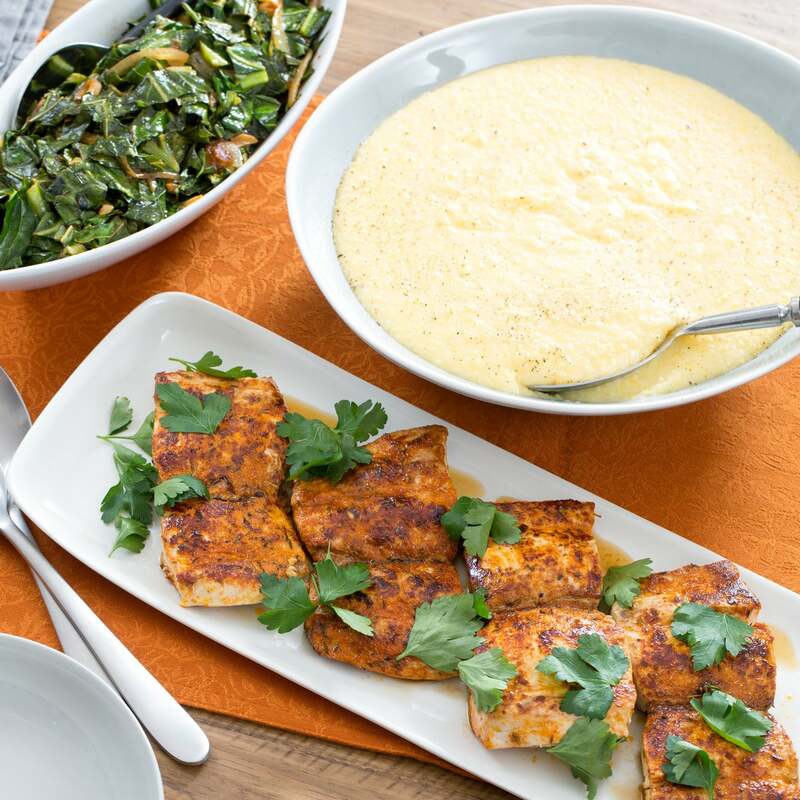 Serve with the collard greens on the side. Enjoy!